Ballard Parent Center, 2375 Congress St. 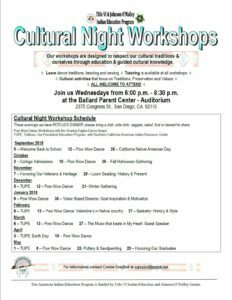 Learn dance traditions, beading and sewing, Tutoring is available at all workshops. Cultural activities that focus on Traditions, Preservation and Values. All welcome to attend! Copyright © 2019 Southern California Tribal Chairmen's Association. Theme by Puro.